This morning, I came across this article that discusses the concept of “life panels.” Life panels are a reimagining of the concept of the death panel, which has become a heavily politicized idea. Life panels, however, are removed from the stigma that comes with the death panel idea. While life panels are not yet a thing, they raise issues with the current approach America has to physician-assisted suicide. Currently, Oregon, Washington, and Vermont are some of the few states that allow for physician-assisted suicide. However, while this sounds great for those states, the decision to end one’s life has to be made when the person is fully competent. This complicates things for people like the author of the article from earlier, whose mother is 95 years old, limited to a hospital bed, with little to no quality of life. However, because she has entered dementia, she is no longer legally competent to choose to end her life. Why is choosing to end one’s life such a controversial topic for Americans? For me, I see it as a product of America’s religious fervor and how it has intertwined itself with American politics. Because religious Americans often tout the idea of allowing someone to end their life as tantamount to playing God, it has long been outlawed in America. However, these ideas have been partially disrupted by America’s aging population. There are a growing number of Americans who fear losing their faculties, and thus want the right to die in a dignified manner. Speaking from personal experience, my mom’s greatest fear is that she’ll languish with Alzheimer’s in a hospital bed. Because of this, my mother has always had open and candid talks about what she’d want me to do in certain situations. I think this is increasingly common as families experience grandparents that have died under similar conditions. While “life panels” don’t currently exist, I think that someday they’ll be a common part of growing old in America. Physician-assisted suicide is becoming increasingly accepted across America, and American politics will soon catch up to this. With such importance placed on rituals and disposal of the body, we think we have taken care of the body and given it a final resting place. But what if someone was to come along and dig it up? We would be outraged, demanding the return of the body and punishment for the perpetrator right? How recent is too recent though? When a body must be exhumed nowadays, it is very traumatic for the family and many people say that it is disrespectful to the deceased person. 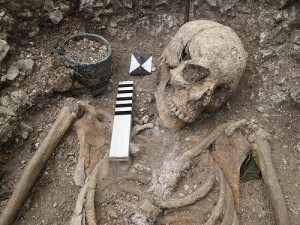 Is excavating a grave the same thing? Is it okay since there is no living family or community connected with corpse? An article from the Economist (http://www.economist.com/node/1056932) discusses how ethics come into play in burial archaeology. When dealing with human remains, archaeologist must be respectful of how the cultures would want their remains to be handled and they often come into conflict with native people (such as the conflict with Native American tribes as mentioned in the article). We must weigh the benefits against the damage that burial archaeology entails. I think that what we learn by excavating these graves outweighs the damage that excavation causes. We learn about the culture of the deceased person as well as general trends of how humans deal with death. Just like exhuming a body for forensic analysis in a criminal case will be worth the emotional pain for the valuable evidence it provides. I came across an article in the latest issue of Mother Jones that I found very interesting. The article describes a woman in need of any emergency medical abortion, for she miscarried one of the twins that she was carrying, and was put at risk of internal bleeding. The chances that she would lose the other twin were almost guaranteed. Her local hospital was in the middle of a merger with a Catholic hospital company, which required doctors to abide by the church’s religious directives. Because of this provision, she was forced to travel to a hospital hours away to complete the procedure. Without engaging the debate about the desirability of religious healthcare services or the abortion issue, I’d like to look at the question of what happens when life-affecting medical services are not provided. In the example given, a woman’s life was put at risk because she was unable to obtain the necessary abortion. But another issue raised is what happens when end of life requests are ignored. In these religiously-oriented hospitals, patient’s requests to be removed from systems of life support are ignored, even if these desires are communicated in living wills. The article details the increasing prevalence of Catholic hospitals, which have been on a “merger streak” nationwide, acquiring increasing numbers of hospitals, insurance plans, and nursing homes. In fact, Catholic hospitals alone care for one sixth of American patients. However, their policies seem to contradict aspects of federal law and thus raise interesting questions about the ethics of end of life care. Despite some of the issues involved, end of life wishes and living wills seem to represent the ultimate freedom in American society; what symbolizes free will more than the ability to determine your own death? Yet, the rise of these religiously-motivated organizations puts a constraint on this freedom, or the ability of an individual to reach what they determine is a good death. Some of the questions we could raise for discussion, without going into religion or politics, are illustrated through this article on religious hospitals. They present the dilemma of what happens when medical and end of life wishes are not respected. Garden of Innocence is a non-profit organization that started in San Diego in 1999 that provides dignified burials for abandoned or unidentified children. In most cases, the children have died in a hospital and their bodies have been released by the county medical examiner to the organization after parents have not been found or convinced of claiming the body after 30 days. Other children have been found dead in other settings (i.e. garbage dumps), and their parents have not been found after months or years of investigation. The organization buries each child in a handmade coffin, with a blanket and a toy. These children often do not have a name, or their name is not known, so a member of the community is encouraged to give him/her one. Additionally, a poem is made for each child, which is read during their burial service. Hundreds of people, strangers really, come out to service (which usually is for more than one child) to commemorate the life of the child. Part of ceremony consists of passing the casket or urn from person to person, signifying that the child and the community have been mutually touched by each other’s presence. This organization has expanded at the national level, with 17 gardens across the US. Their hope is to expand to all 50 states. My first instinct when learning about this organization was that they do some great work. Isn’t everyone deserving of a proper funeral and burial? This organization provides a service to a forgotten portion of society. However, when I learned that they assign names to the children I became a little bothered. I understand that having a name gives someone a sense of dignity, a sense of being, a sense of being present. However, is it really appropriate for a stranger to give a child a name? In a news article I read, which you can access here, someone justified giving a child the name of Daniel because it was a traditional family name. Another child was named Jose because a lot of Joses work at the garden. By doing this doesn’t this become less about the child and more about the people involved in the burial? But then again this demonstrative of what we have been talking about all semester…that death is more of a concern for the living than the dead. While I understand that people’s intentions are most likely good when doing this, that by giving a child a traditional family name you are making them part of your own (family), to a certain extent it takes away a certain degree of altruism to which we may want to ascribe to these funerals. Because there were not preexisting bonds between the child and the “mourner”, you start to question why exactly they taking part in the funeral and burial proceedings? What kind of people are the ones who participate in these funerals? Is it a way for people to deal with the loss of a child or loved one themselves? When I looked more into how this organization obtains their caskets I found that they have a partnership with a woodworking department at a high school and a Boy Scout troop. They have dubbed the program Children Making Caskets for Children. While I can see why some people can see this program as problematic, I think it is a good way to get children to start talking about death, a taboo within our society especially among this age group. This can be an opportunity to help these children making the caskets conceptualize and understand death better. It can definitely foster a healthy conversation and space for questions on the topic to be asked. Although it is not indicated, I hope that the children are prepared and sensitized on the topic before going on to build the caskets. This is important, especially when building caskets for children, nonetheless abandoned and unidentified ones, because many children may not have prior experience with death, child death, or child abandonment. How do you feel about this organization’s work? What do you think about this Children Making Caskets for Children Program? **I’d like to note that I think it is important to consider what societal factors may lead someone to abandon their child. It is easy to view the child as the victim through the lens of an organization such as Garden of Innocence, but it is vital to realize that the child’s parents could be victims of societal forces that may lead them to inevitably having to abandon their dead child. Early in the spring of last year Craig Lewis, a 55-year-old Texas native, found himself confronted with a life-or-death situation. After battling with a complicated heart condition leading to the build up of abnormal proteins in his heart, Lewis was told by doctors that he had just 12 to 24 hours to live before his heart would give way entirely. Where all other heart-supporting technologies proved to be insufficient, Lewis’ only chance of survival lied in removing the heart completely—and putting machinery in its place. While Lewis’ doctors claim the device is the “waive of the future” his story left me with more concern than excitement. Lewis’ story represents the natural degradation of the body that occurs with aging, and science’s extreme intrusion into that process. While Lewis’ body was ready to give up, Lewis was ready to fight back, and with technology on his side, he won the battle. With the invention of this new device will individuals always have the option of “choosing” to live? When our organs, one by one start to erode, will technology advance to the point to which we can just replace them with shiny metal versions? It’s already been proven that modern advances in technology have significantly improved human life spans. It seems as though heart-replacement technology seeks to made life endless. Craig Lewis’ story can furthermore be seen as indicative of America’s overall view of death as not a natural and inescapable ending, but a fearsome process that must be stopped at all costs. Americans seems to think that death is an injustice, a force to battle against. While it’s true that the death of an infant or child seems premature, at what point must we admit that individuals are ready to die? Millions of our ancestors have come and gone. The idea that future generations can control their life spans, and enhance them to an unnatural extent, seems not only frightening, but quite frankly a little absurd. Death is inevitable, and I believe it is the time to embrace it—not run from it though technological advances. Death is a very difficult problem to deal with, especially when suicide is the cause. After a suicidal death, other than grieving, people often feel guilty as well as angry toward the deceased person because they feel that the person’s death is related to them. Suicide represents the tie between the society and the individuals. As we have learned in class, a too strong or weak tie between the person and society can lead to different types of suicide. Suicide is very personal because the choice is made by the individual. However, it is also not personal because there are many external factors that influence a suicidal decision. In my opinion, when deciding to suicide, people often try to identify themselves in relation with other people in communities. Therefore, the society’s value and culture indirectly control whether or not a person has the “rights” to take his own life. In class, we talked about suicide in suicide bombers. These people are willing to give up their life for the future of the society. This is partly due to the fact that society glorifies their death as heroic. The suicide bomber might feel that he will bring honor to his family and nation. Such relationship between the individual, family and society gives the person the “rights” to take his own life freely. However, in some cultures, people are not “allowed” to take their own lives. In countries with strong Buddhism influence, the value of families is especially emphasized. In a very famous Chinese tale, Nezha is a child deity. As a little child, he accidently kills the Dragon King’s son who comes to bully his friends. Nezha’s father who is always not pleased with Nezha almost sacrifices his son to save the people. However, Nezha kills himself first to save his people from the wrath of the Dragon King. Nezha did not just kill himself; he carves his flesh and bones and returns them to his parents. This action is to repay the “debt” of his parents giving birth to him. The following is an excerpt of the tale, when the Dragon King demands Natra to “take responsibility” for his action: http://www.youtube.com/watch?v=8THpvyba3Lg. From this tale, there is a notion that your body does not belong to you. It is given to you by your parents and you have no rights to destroy it without their consent. Why do we feel angry at the deceased and think that the person is “selfish”? The person is selfish because he did not consider the feeling and well beings of other people, even though his body is supposed to be his own to take? Therefore, society’s value in some way gives a “yes” or “no” to a suicidal act. When a person disregards the social value, his death is regarded as a bad death. Yesterday I watched the TLC show My Strange Addiction after getting home from our Death and Burial class. My timing has never been so perfect. The episode that was on was about Casie, a 26-year-old widow who became addicted to eating her dead husband’s ashes after his premature death. According to Casie, she first tasted his ashes when after spilling some on her hand. Instead of washing the remains off, she decided to eat them so as not to waste them. Ever since that moment, Casie has eaten a total of one pound of her husband’s ashes. The most interesting part of the story is that Casie sought help from the TLC show because she understood that the ashes would run out eventually. She feared that the total loss of her husband once the six pounds of his ashes were completely consumed would be too much for her to handle. This case is extremely interesting because the thought of the physical harm that the ashes could cause to her body is overshadowed by Casie’s intense need to be close with her late husband. As many of us know, human ashes include many toxins, including carcinogenic formaldehyde, which is used to preserve the body for funeral rituals before the actual cremation. Surely a part of Casie always knew that eating her husband’s ashes was not healthy, regardless of the extent to which she understood this. However, when asked about this possible physical harm, Casie expressed that she never worried about it. To her, the ashes could never be as harmful to her body as the death of her husband was to her soul. Casie’s story offers a few ideas to think about. Firstly, why did Casie feel that she needed to eat her husband’s remains? In her interviews, Casie repeatedly talks about how she feels a bond with her husband that she has missed. But this would only be in her mind. I don’t think that there can be any physiological explanation for the happiness that eating her husband’s remains brings to Casie, other than a possible high from the chemicals. Secondly, at what point did Casie realize she needed help? It is actually extremely admirable that Casie was able to understand that she needed help. I could imagine that someone in such a sad emotional state would have the insight to seek help! In Casie’s case, the grief of her lost loved one never came to an end. As we have discussed before, societies have burial rituals in order to transport an individual who has lost a loved one from a state of extreme grief and bereavement to a state of acceptance. Whether it was due to the inability of her society or herself to facilitate a successful burial ritual for her husband, Casie’s grief was never brought to a close. It is possible that after her husband’s cremation, Casie did reach a state of understanding and acceptance. However, after tasting her husband’s ashes, all acceptances were shattered. In the end, Casie was treated for a mental illness and was prescribed anti-depressants and talk therapy sessions. This is not the first time that such a case has been discussed. There are multiple articles online about spouses who choose to eat their dead partners’ cremated remains. Most of them say it is because their grief is allayed because of the act. Would there still be a reason to treat these individuals for a mental illness if these remains did not pose a physical threat? Is it really that bad to want to eat your dead partner? Aside from health purposes, burials are widely recognized as the most common and appropriate ritual to bring closure to the family and to demonstrate respect for the dead. With the advent of new technology, new methods to fulfill the aforementioned have manifested. In fact, most recently, a unique opportunity for the bereaved proves to be a viable option to memorialize the life of the deceased. Elysium Space is preparing to extend their mortuary services by launching human ashes into space. It is the hope of the company that by 2014 they will begin sending cremated human parts into space via a memorial spaceflight. It is estimated that the cost of a space burial will be set at $2,000, much lower than the national average for burials in the United States and thus making it a more affordable option. According to Elysium Space, customers receive an ash capsule that will contain a “symbolic portion” of ashes and on which they can engrave a limited number of initials. Once the capsule arrives at the company’s launch site, they will engrave a personalized remembrance message to be attached to the spacecraft. Finally, the capsule is launched into space only to return to Earth a few months later from orbit, where it will ultimately burn up. The most captivating part about this space burial experience is that the bereaved can track their loved one’s ashes while in orbit through a mobile application. Also, when the ashes burn up while re-entering the Earth’s atmosphere, it will resemble a shooting star. This is a very interesting proposal and so I look forward to seeing the success rate of such a unique mortuary experience. It is reported that there have been interests for the services of Elysium Space from people in both the United States and Japan. A concern, though, of many individuals will probably be the fact that by launching these particles into space, we would be adding to the already significant space polluting issue. Also, there will also be a number of those who think that this is another method of making money off of the dead, perpetuating the use of practices that commercialize death. So, not all will be thrilled with such an innovation. However, space burials prove to be an economic advantage to those who cannot afford a traditional funeral service and they also provide a memorable experience that should guide the bereaved during their period of grief, but also help to facilitate the healing process. I do think that it may be wise for the company to offer cremation services in addition to the launch of the memorial spaceflight. Even so, space burials are an alternative that definitely should not be ignored. As Americans are living longer and traveling is becoming more accessible, families often scatter across the country and sometimes the globe. People typically start prepaying for funerals around the age of 50, but it is becoming increasingly more likely that the place you live now may not be the place you end up at the end of life. Many prepaid funerals will not transfer your funds to another funeral home, nor will they give you a complete refund. Between prepaying for a funeral and the actual time of death, a person’s end of life wishes may change. For example, more and more people are opting for cremations. However, if you prepaid for a funeral and chose to change your plans, the money will most likely not be refunded. With prepaid funeral plans there are no guarantees to protect your money from being stolen. Some funeral directors can take advantage of customers. Many people opt for a Pay on Death Savings account instead of a prepaid funeral. A Pay on Death savings account is an account that will be cashed out to a beneficiary at the time of death. In the end, the pros and cons are yours to weigh, just as your funeral arrangements are yours to make. As an EMT volunteer for Emergency Medical Services, I have learned much about preparation for catastrophes, what we call multiple casualty incidents (MCIs). Just the other day, we worked together with the the fire department, hazardous material unit, county ambulance services, and police for a MCI simulation where we more or less practiced working in an unexpected catastrophe, natural and manmade. These simulations are as real as they can be with “‘blood, guts, and galore”, screaming people, chaos and more. I have participated in a variety of simulations as a patient, medic, and observer. When we first come onto an incident, it is our job to save as many people as we can, but to not waste time with people who require more than the basic care. Triaging is classifying people as green, yellow, red, and black. As a medic, the hardest thing to deal with in these situations is triaging someone black because black means death or dying. In mass catastrophes, this could mean that someone is still alive, but won’t make it under the current situation. The person could be still screaming for help, but if their body is severed in half, we are to label a person black and move on to the next victim. This is traumatizing for all parties, both the medic and for the dying person. I think this is just a small illustration of how mass catastrophes can drastically affect life. Just the seemingly endless amount of death and dying coupled with chaos and confusion changes the face of death. Maybe this is why our media is obsessed with apocalyptic, post-apocalyptic, and the “end of the world”. These themes have permeated everything from movies to music to books. Recently, the CDC published information on how to prepare for a zombie apocalypse. While funny and portrayed in a mildly joking manner, the point is to educate people on preparing for disasters including wars, terrorist attacks, tornadoes, hurricanes, earthquakes, etc. (11_225700_A_Zombie_Final). If you go through the comic, it is a little funny, but the simple idea of a MCI has taken off in a variety of ways that have people thinking about the changes needed to deal with so many bodies at once. What do you think? How do you think our society understands MCIs? How do we deal with mass death on an emotional and physical level?